Sanyo makes pretty good compact digicamcorders for the money, and their new three-pronged line-up packs a lot of good stuff for very little $$. First up are the full HD DMX-HD2000 and DMX-FH11 (above). Both record 1080p progressive video at 60 fps—something they're claiming as a world's first for a "consumer" cam (I don't know what price distinction they're making here). These can also do slow-motion at 240 and 600 fps—not quite Casio EX-F1 levels, but pretty close (no word on the resolution of the slo-mo capture). The main differentiation is the form factor—the HD2000 is a pistol grip (and has 8GB of built-in memory), and the FH11 is your more traditional horizontal shape. The prices are great—$US500 for the horizontal and $US600 for the apparently sexier pistol. Next are the VPC-WH1 horizontal and VPC-CA9 pistol waterproof cams. Both shoot 720P underwater (up to 3 metres for the horizontal, and 1.5 metres for the pistol). They're $US400 and $US350, respectively. And finally, the compact VPC-TH1 (horizontal, $300) and VPC-CG10 (pistol, $200). These are tinycams that shoot 30fps 720p—the pricier TH1 adding a beefier 30x optical zoom—giving the Flips and the Kodak Easyshares of the world a bit of a run. Guys—a word to the wise—how about some standardisation of the model designations, no? All are available in the US starting in March. NEW YORK, Jan. 21 /PRNewswire/ — SANYO Fisher Company, a division of SANYO North America Corporation (SANYO) is pleased to introduce its new line-up of Dual Camera Xacti cameras designed to enhance active lifestyles by providing both high-definition video and photo capability in a single, easy-to-use compact camera. The new mixed form factor (Horizontal, Vertical) line-up of six (6) SANYO Dual Camera Xactis includes new Full HD 60fps units (VPC-FH1, VPC-HD2000), waterproof HD models (VPC-WH1, VPC-CA9) and Compact HD cameras (VPC-TH1, VPC-CG10). Availability for the US market will begin in March 2009. 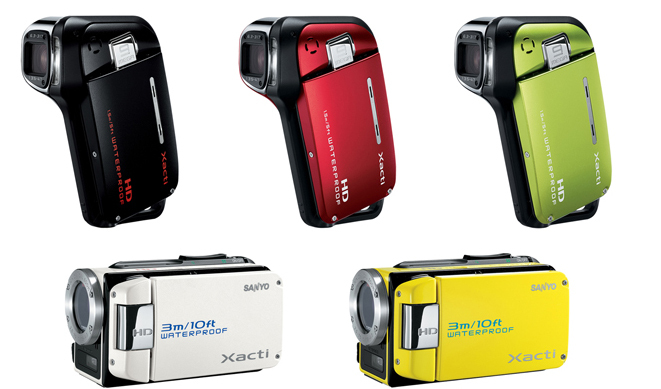 New for 2009, Dual Cameras in horizontal body styles join models in Xacti's signature vertical form factor, offering a broad line of models designed to appeal to discerning consumers and retailers. Dual Camera Xactis record photos and videos to SD/SDHC media cards (sold separately) and are thumb-operable for key functions, with separate video and photo buttons for easy switching between shooting video and photos. Unlike conventional camcorders, there's no need to stop to switch modes and miss capturing those once-in-a-lifetime moments. With two new Dual Camera models-that's true even when those special moments occur underwater! The 2009 Dual Cameras offer the convenience of both television and computer-use/viewing, plus easy Web sharing of recorded high-quality MPEG-4/H.264 video clips. Several new models are compatible with optional lenses for expanded shooting flexibility. Some 2009 models (WH1, TH1) also offer an amazing recording time of up to 3 hours 20 minutes thanks to a small but powerful SANYO battery and an engine designed to save energy. With a Dual Camera Xacti, one is all you need. The Full HD Dual Camera Xactis are truly the benchmark in high definition, offering 1920 x 1080 pixels, and 60 frames per second recording for crystal clear, smooth motion videos. These highly advanced cameras not only offer a standard 1080i (interlaced) format (recording at 60 fields per second), but with the SANYO proprietary CMOS engine, recording is also available in 1080p (progressive) format at an ultra-smooth, professional-looking 60 frames per second. In response to massive global demand for high definition equipment, SANYO's Dual Camera Xacti line-up for 2009 are all designed to record high definition video. SANYO's compact HD Models offer 720p (1280 x 720) HD capability and record at 30 frames per second. The VPC-TH1 also offers an impressive 30x optical zoom and an incredible 3-hr 20-min long continuous recording time-all in HD! With a conventional digital camera or camcorder, many users are understandably reluctant to film or shoot in the rain or other wet environments, fearing water damage to the camera. The VPC-WH1 and VPC-CA9, however, have earned the highest possible IEC 60529 waterproof rating-IPX8-allowing high definition 1280 x 720 30fps footage to be captured without worrying about the effects of water or snow. The VPC-CA9 is operable down to a water depth of up to 1.5 meters (5 feet), while the VPC-WH1 is submersible down to an astounding 3 meters (10 feet). With SANYO's advanced waterproofing technology, these cameras can be used without thinking twice in the rain, for marine sports such as surfing or snorkeling, or for winter sports such as skiing or snowboarding.